SSC CGL Result 2016 Tier 1 Exam Tier 2 Date: The Staff Selection Commission (SSC) Combined Graduate Level (CGL) examination took place in the months of August and September 2016. 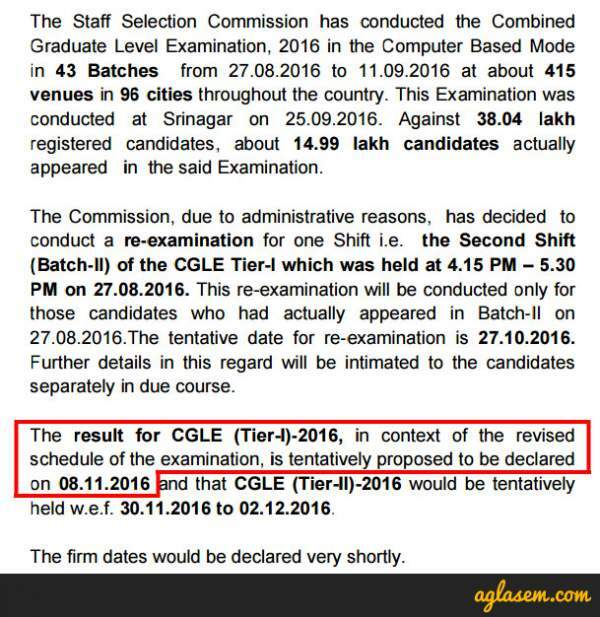 According to the official notification, it is said that the results of SSC CGL Tier 1 exam will be declared on November 8. The previous notice of SSC stated that Tier 1 evening shift exam conducted on August 27 was canceled. The same candidates will have to re-appear for the same on October 27. After the Tier1 results, the qualified candidates will appear in the further tiers, i.e. 2,3, & 4. To make into the next round, the aspirants will have to score a minimum of cutoff marks which SSC will reveal later on. The Commission released the recruitment notification for a total of 3,815 Group B & C posts in various Ministries / Departments / Organizations. Thus, CGLE 2016 examination was conducted by SSC for the same. Check: CBSE CTET Result 2016. Earlier, the Tier 1 exam was scheduled to take place in May. But, after the introduction of level 3 and 4 exams, it got postponed. Finally, it rescheduled and conducted in August and September. The inclusion of more tiers resulted in the change of exam pattern. The overall number of questions were reduced to 100 from 200. Check: IBPS CWE RRB V Admit Card 2016. More than 38 lakh candidates registered for the CGL 2016 exam. However, around 14.99 lakh aspirants appeared for the same. Tier 1 was conducted in 44 batches from August 27 to September 11 and 25. The evening shift (4:15 pm to 5:30 pm) held on August 27 got canceled. Those candidates will have to re-take the exam. The re-exam admit cards has been released and available on the SSC’ official website. The candidates can download them as it is a crucial document to carry at the test center. Most the candidates told us that tier 1 exam was of average difficulty and most of the questions were easy. This means that we can see an increase in the SSC CGL Tier 1 Cut off marks. It can go as high as 125 marks for the aspirants of general category. Most of the candidates found the questions in the General Awareness category tough. So, it will have a significant role in deciding the candidates’ selection chances. However, the expected cut off marks for OBC, SC, and ST category would be 102-110, 90-98, and 84-88 marks range. The exact picture will be out and clear soon once the tier 1 CGL results are out. After the tier1 exams had concluded on August 25, the candidates started expecting the result declaration date to be in the first week of October. However, the official notification came on October 14, and it stated that the results would be published online on November 8. The same notice served the official dates for Tier 2 exams from November 30 to December 2. The exact dates will be notified to the qualified candidates as they get their admit cards / hall tickets. The rest of the two tiers will take place in January 2017. Thus, the SSC final result 2016 will be out in April 2017. Stay tuned for latest SSC news and CGL 2016 updates.